UMSU president Jeremiah Kopp in council chambers. Photo by Craig Adolphe. Responding to allegations of financial misconduct and a petition calling for his removal from office, University of Manitoba Students’ Union (UMSU) president Jeremiah Kopp said the separate issues are politically motivated. UMSU’s regular council meeting was thrown into disarray March 10 after three successive emergency motions were presented alleging fraudulent activity and misuse of funds by Kopp, who was cut off from use of the student union Visa card that was charged nearly $14,000 in allegedly unapproved expenses. 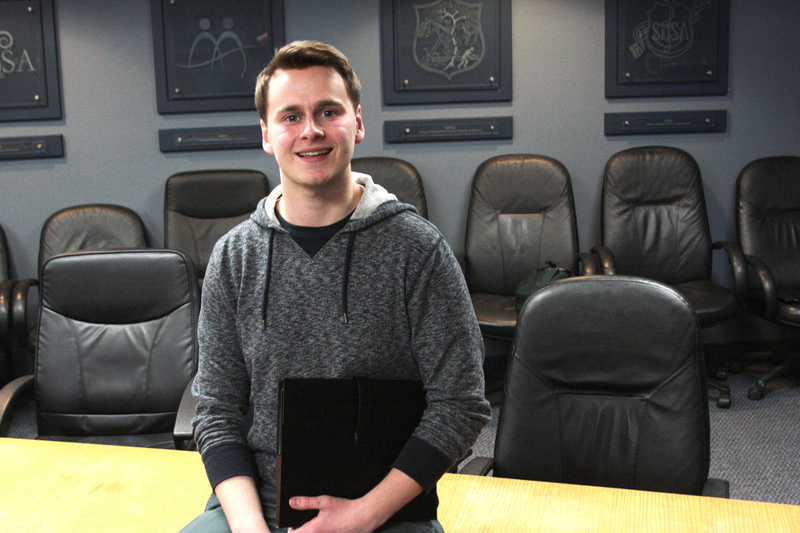 In a separate presentation to council, two Arts Student Body Council (ASBC) representatives claimed Kopp should be recalled from his position as president, citing a series of bylaw infractions. A petition is being circulated with the goal of collecting the roughly 2,100 signatures required to force a referendum on a recall vote. The three emergency motions were presented after members on the council’s finance committee raised red flags earlier this week surrounding unapproved expenses submitted to the union, and two committee members – UMSU Science Students’ Association representative Karen Batchelor and vice-president student services Jessica Morrison – began reviewing statements for an UMSU credit card belonging to Kopp. The first motion made public credit card statements for the UMSU executive Visa card going back to April 2015, which revealed nearly $29,000 in expenses over a 10-month period. The second triggered a forensic audit of UMSU finances for the 2015-16 year-to-date to begin no later than March 31. The third called for Kopp to turn over access to the card, which he himself supported. The allegedly unapproved expenses include items as innocuous as $2.50 purchases from Coca-Cola machines and $11 U of M parkade fees to nearly $4,000 in office furnishings, a more than $600 bill at Joey restaurant, $350 at the Manitoba Liquor Mart, and $230 at Shoppers Drug Mart for Lindor chocolates. Kopp maintains all of the expenses were legitimate and conducted through the proper channels. “I’m confident that a forensic audit ordered by UMSU council will demonstrate that these allegations are baseless,” he said. Kopp charged that Morrison, who resigned her position from UMSU council at the same meeting, brought forward the expense claims in an effort to politically slander him. The two ran on a slate together in the 2015 UMSU general election but had a falling out and Kopp said at the meeting the two were involved in mediation. “This is a politically motivated attack,” he said. Isaac Weldon, vice-president of the Arts Student Body Council (ASBC), and ASBC chairperson Cole Kubay made a presentation at the same meeting and provided council with two pieces of information they claim disqualifies Kopp from holding office. First, they circulated a letter dated April 14, 2015, from Rorie Mcleod Arnould, former president of the University of Winnipeg Students’ Association. The letter, addressed to UMSU council, claims both Kopp and vice-president advocacy Rebecca Kunzman floated the idea of an UMSU fee increase to offset cuts to the U of M operating budget in a meeting that included various Manitoba student unions and Minister of Education and Advanced Learning Peter Bjornson. Despite it being addressed to UMSU council, Weldon and Kubay claim it never reached councillors at the time. Second, Weldon and Kubay presented evidence that Kopp is enrolled in four three-credit hour courses, whereas the UMSU governance and operations manual states that UMSU executives can only take eight credit hours per term in order to meet their responsibilities with the union. “I do understand that not everybody might agree with the decisions that were taken this year but holding a recall vote with six weeks left in my term is perhaps is not the wisest use of student money and union resources,” said Kopp in response to the recall petition. “In no way, shape, or form did we indicate that students would want a tuition increase to cover the budgetary shortfalls of the university and it’s a complete misrepresentation of the facts,” he said. According to UMSU’s policy manual, the union is opposed to all tuition and ancillary fee hikes. “It was absolutely not doctored. The survey represents the views of the students that responded to it,” he said. The funds from the fee increase are set to fund child care on campus, bursaries for indigenous students, undergraduate research, and renovations of UMSU-owned spaces in University Centre.